This product is a non-detergent soap which can be used regularly to clean clothing and equipment without damaging the Durable Water Repellent (DWR) coatings. Use this product instead of detergents or washing powder. Rinse thoroughly in clean water. 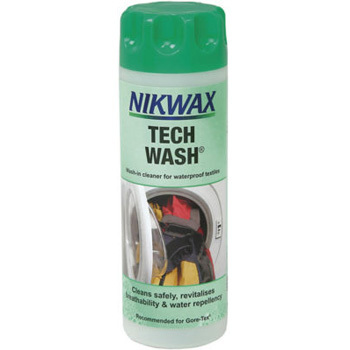 Tech Wash can be applied neat to fabrics as a stain or grease remover prior to washing. To clean 1-2 items use 2 full caps (100 ml) in soft water or 3 full caps in hard water. Quantities used will depend on condition and size of items.